Irish riders were in superb form last night across the Atlantic, with Paul O’Shea, Conor Swail, James Chawke, Shane Sweetnam and David Blake all recording excellent results in the USA and Canada. 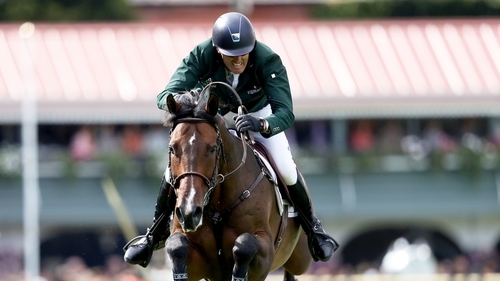 Limerick’s Paul O’Shea filled the top two places in the $132,000 Greenville-Spartanburg International Airport Grand Prix at Tryon in North Carolina, USA. He took the winners prize with the 10-year-old gelding Skara Glen’s Presence after jumping clear against the clock in 36.53 seconds. O’Shea also claimed second place aboard Imerald Van’t Voorhof with a time of 37.09. Clare’s David Blake also made it into the jump-off and finished sixth with a double clear round aboard Keoki. A delighted O’Shea said: "The course rode well. Obviously, I’m happy with how it went. It was a very nice track and a very nice result with eight clear in the first round. I think it was a really good course," he continued. "They’re both very good horses and they’ve been going really well. They’re used to this level, now, too – even though they’re both 10, they’re both still a little inexperienced." After a successful autumn season at Tryon, O’Shea plans to give both his mounts some well-earned time off before heading to Florida for the winter. "They’ll start back in WEF again and do some smaller classes and build back up. When I start them back I’ll see how they feel, rather than say they’ll jump week two at the Grand Prix, if they need smaller classes to build back up we’ll take it week by week." At Royal West show in Alberta, Canada, Ireland’s Conor Swail and James Chawke filled the top two places in the $100,000 Truman Homes Cup. Swail and Koss Van Heiste secured victory with a clear in 44.29 – just a hundredth of a second ahead of fellow Irish rider James Chawke and Grasshopper in second, while Canada’s Vanessa Mannix finished third with Valentino D’Elte. "It feels wonderful. I was very happy with my round," said Swail, "[Koss Van Heiste] is very young, he’s only eight years old. Tonight was a bit of a surprise to be honest but it is certainly a nice surprise." Swail, Chawke and Mannix have been a team for many years, riding in Grand Prix’s and training young horses together. "What you see in the ring is only a small part of the process that goes into results," said Swail when asked about the team dynamic. "Myself, James and Vanessa – we’ve been together for many years as a team – tonight we’re one, two and three in a very prestigious 3-star event; it’s wonderful." Meanwhile at Washington International Horse Show in the USA, Cork’s Shane Sweetnam finished fourth with Don’t Touch du Bois in the $135,000 Longines FEI World Cup for the President’s Cup. They finished with one fence down in the jump-off where victory went to America’s Beezie Madden with Breitling LS.